Woburn City Hall is located at 19 Common Street, Woburn, MA 01801; phone: 781-897-5800. 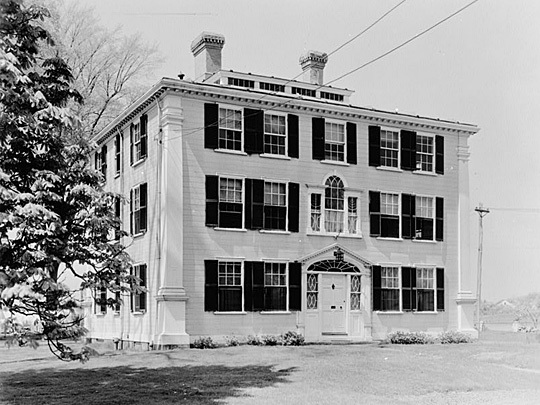 Photo: Colonel Loammi Baldwin Mansion in 1936, Elm Street, Historic American Buildings Survey [HABS MA-419], Arthur C. Hasskell, photographer, memory.loc.gov, accessed January 2011. Home was listed on the National Register of Historic Places in 1971. First settled ca. 1640, Woburn was incorporated as a township in 1642. In 1636, 6 years after Charlestown was founded, its residents began to feel crowded and the town fathers selected Woburn for more land for their farms. In the latter part of the 18th century, two incidents occurred in the domestic life of the community which caused a pleasurable agitation among the decorous citizens. One was the case of Ichabod Richardson, who was seized by the British while on board a privateer and kept a prisoner for about 7 years. His wife, convinced that her husband was dead, married Joshua Richardson. Upon his release the prisoner came home to find his family under another man's roof. The matter was adjusted by the good wife's returning to the bed and board of her first husband. A more realistic transaction of about the same date was the barter by one Simeon Reed of his wife to Hames Butters of Wilmington for a yoke of oxen. The building of the Middlesex Canal in 1803 played a major part in the town's economic development. During the first half of the 19th century, Woburn rapidly changed to an industrial community, with shoe manufacturing and leather tanning predominating. In the 10 years before the Civil War the increased demand for unskilled and semi-skilled cheap labor led to an influx of foreign races. By 1865, there were 21 tanning and currying establishments and 4 factories for the manufacture of patent and enameled leather. Later, machinery, glue, chemicals and foundry products were added to the list. Before the crisis of 1929 there were 53 manufacturing establishments with more than 2,000 employees, more than 50% being leather or shoe companies.